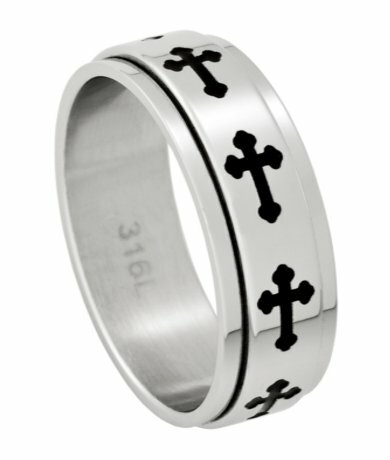 This is a cool cross spinner band that features an oxidized cross that goes all the way around the outside of the spinning portion of the ring. 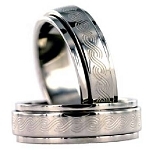 The ring is made of surgical stainless steel and is very popular. 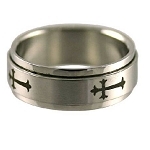 I bought this ring for my son to remind him of who he is in God. He thought it was awesome and he values the meaning of it highly. It is a beautiful ring and he is proud to wear it. He constantly spins it, so time will tell as to wear and tear. It took a very short time to get here. Postage was very reasonable. I got this ring for my husband. this is the first ring that he wears all the time. he has had had other rings but he would complain bet they were too tight or too wide etc. he also States that it is and opener to witness to others. I was impressed with the quality of the ring. My husband loved it. Unfortunatly it was just a little tight and I was unable to order half sizes. This was a Christmas gift for my spouse. He really likes it and was amazed by the fact that it spins. It is also a great value.